Some special editions come with figurines, limited edition art books, or soundtrack CDs. This one comes with a baby. With special editions now being the norm rather than the exception, they were bound to seep into family game territory someday. That day has arrived, and it's more terrifying than anyone could have imagined. 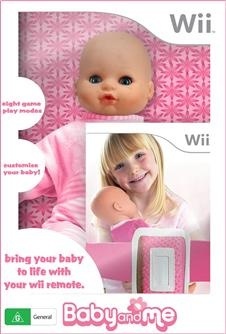 505 Games' Baby and Me Special Edition will come with an actual baby doll to attach a Wii remote to, which will make the doll seem to come alive through the controller's speaker. Unfortunately, only Australians will get to experience the horror, with the game planned for release down under but in no other regions. This game sounds really exciting, especially how you can "send baby to sleep" and play "clap." When you're using the Wii Balance Board to burp a baby, I think that's the sign that you've lost your soul. Supposedly, you can also neglect your baby and have it grow up to be a subway janitor, but only if you have the Wii MotionPlus attached. So much for hoping that all of these baby games would go away; they're only getting stronger.